I do a lot of backpacking. I know backpacking terminology. So when I see a pack labeled as having a “rainfly,” my antennae go up. To protect a pack’s contents from rain, you either have an internal pack liner (a large, thick plastic bag into which all the contents are stuffed) or an external rain cover, which has an elastic border and which slips over the entire bag. Usually the pack cover is kept in an outside pocket, for quick deployment. But a “rainfly”? No. That’s what double-wall tents have. Their inner portion consist of a sewn-in bathtub floor and bug netting, and then there’s an outer portion that protects against rain and is removable (for warm, clear nights). So a tent has a rainfly, but a pack has a pack cover. If you can’t get the terminology straight, it means you likely haven’t gone backpacking. But that’s not the worst thing about this AmazonBasics pack. The worst thing is the pack itself. It’s a brick. Amazon says it weighs 5.11 pounds. That’s 82 ounces. The pack’s volume is listed as 65 liters. (Pack volume is measured in liters usually.) Compare a comparable pack that I have, the Ultralight Adventure Equipment (ULA) Ohm 2.0. Its capacity is 63 liters, but its weight is only 35 ounces, or 3 pounds less. That’s a big difference when you’re schlepping gear up a steep trail. On an average backpacking trip in mild weather, those 3 pounds will represent one-eighth of the total carried weight of about 24 pounds, everything included. And what do you get for those extra 3 pounds? Pockets and zippers, apparently. Just look at the picture. There’s a zippered compartment at the bottom for access to a sleeping bag: useless, because the sleeping bag is the last thing you take out of a pack, not the first. On the sides are two large zippered pockets. For what? Not for water, because below those pockets are two mesh pockets where water containers can be carried. Besides, those upper pockets are too high up to be reached without the hiker having to take off the pack. Then look at all the cinch straps. A few are necessary, but why have straps to cinch the sleeping bag compartment to the main storage area? Oh, yeah. It’s because there is a sleeping bag compartment in the first place. There probably is an internal divider between it and the main compartment–wholly unnecessary in well-designed packs because they have no division of compartments: the whole pack is one big compartment into which items are stuffed atop one another to minimize volume. There are other accoutrements that add to the weight of this pack, but the main culprit no doubt is the fabric. It’s probably thick and heavy and therefore cheap. 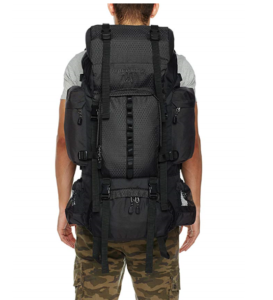 Lightweight pack fabric is expensive, and this pack is anything but expensive. The one thing this AmazonBasics pack has going for it is the price: $64.99. The ULA Ohm 2.0 costs $210.00. That’s a big difference, but with the ULA pack you save not only weight but your back. I’m quite sure the AmazonBasics pack, while looking good in the product photo, will ride poorly on your back—not something you want on a long hike. On a short hike (short in miles and duration), the 3 extra pounds may not mean much, nor will the general discomfort of the pack. If you can’t carry an extra 3 pounds on a hike of 3 miles (to a base camp from which you’ll do day hikes), then maybe you shouldn’t be hiking at all. But on any serious hike, where you’re hiking more daily miles and for more days, the extra comfort and lighter weight of a well-designed pack can make all the difference. I know, because my back tells me so. In my book How to Fail at Hiking Mt. Whitney I have a chapter on “Gear to Get and Gear to Forget.” I don’t mention this AmazonBasics pack, but I do provide pointers that can make the difference between having a pack that works and one that works you over.